Getting Error “Lotus Notes Contacts Not Syncing”? Are you unable to sync your contacts in Lotus Notes email application? Remove this error by syncing your contacts with an effective solution. The contacts in Lotus Notes are stored in the hard drive with a file name called Names.nsf. But due to some reasons, a user can face some issues in accessing his contacts in IBM Notes client. An error can also occur showing “Lotus Notes Contacts Not Syncing” message. It is important to know the reasons behind this error. In this article, we will discuss following reasons and methods to solve this problem. Issues in Address book file i.e. Names.nsf file. What is Replication and Sync in Lotus Notes? Replication and Sync is a great feature in Lotus Notes which allows a user to synchronize the local and offline copies or replicas with one or more Domino servers. If any user is busy with some other work in the email application then also it is possible to sync all the contacts without any obstruction to the user’s work. There is also an option to sync your data items by creating a schedule through which a user can create and synchronize the data automatically as per the schedule he created. 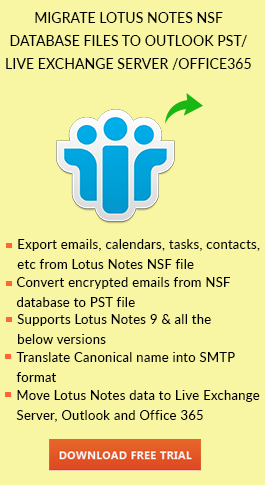 Know how to enable synchronize contacts in lotus notes in the following method. First of all, close the Lotus Notes email application. Now open IBM Lotus Notes email client and then open contacts. Select all the contact by Ctrl + A or by clicking on Edit >> Select All. Now cut the contacts from the View by Ctrl + X or by clicking on Edit >> Cut. Make sure that there is no contact in your address book. Click on File tab >> Preferences >> Contacts from left panel >> Enable “Synchronize Contacts” >> Ok button. Click on Start Now for forced synchronization of contacts. Now you need to check Lotus Notes Contacts. All the contacts are now synced with the mail file. “Lotus Notes Contacts Not Syncing” issue can arise when there is some synchronization error or any network connectivity problem. So, above method shows the way to sync all the contacts in Names.nsf file with the mail file of IBM Lotus Notes. You can simply go to the Replication and Sync page and manually synchronize the contacts. If you are still facing any difficulty in performing such steps, then you can opt for the idea of switching into other popular email client. You can transfer contacts from Lotus Notes to Outlook and switch the email platform.